I’m contacting you again to thank you for your Acorns. They are better and better each day, it’s amazing. Their sound in glorious. Surprisingly they make a great match with a pair of DIY A2 Shishido 805 mono amps. I did not expect this level of performance from these Single End amps, not with an electrostatic speakers. With a good DHT preamplifier the sound is magical, You have to listen to believe. I’m so happy with the Acorns that if I would had a bigger room I will order another pair to stack to this one. The Acorn have the ability to put me into the music like no other speakers I listened to before, independently the type of price range. When I closed my eyes and I’m there in concert room or with the musicians. The level of detail and the image is so real that most of the time it seems I’m listen live music, the sound is so captivating that I never had the will and the time to build (DIY) anything else since I have the Acorns in my listening room. I’m sure these are the speakers for life and I reached my Audio Nirvana. I’m still likes the Quads but Acorns are in another level. Despite the overall sound, the Acorns bass response is surprisingly accurate and deep like very few other Electrostatic (maybe except big Sound Labs) speakers can go. The sparks I had in the beginning with some volume levels was completely gone. Maybe the panels was not completely cure. I don’t know! Now I’m listen music to some reasonability levels without problem. (Note from Rob. Jose had agreed to purchase a kit with a set of stators that had some handling damage causing the insulation to be scratched off in places, while we cleaned them up and sprayed a couple of layers of insulation on them this was not quite enough to prevent stator to stator arcing at high output levels. Jose applied a couple more layers of aerosol varnish, Plastik 70, and cured the problem). The speakers are not completely done yet. I have to find a way to reinforce the frames but the sound are so good that will be difficult to stop listen music in these speakers in the next few months. I’m still thinking to order, if you have available, a spare pair of Acorn panels. I would like to have one pair of spare panels as a replacements if I will need in the future. Thank you one more times for your fine products. I will send you the pictures of the speakers and soon as they are ready. 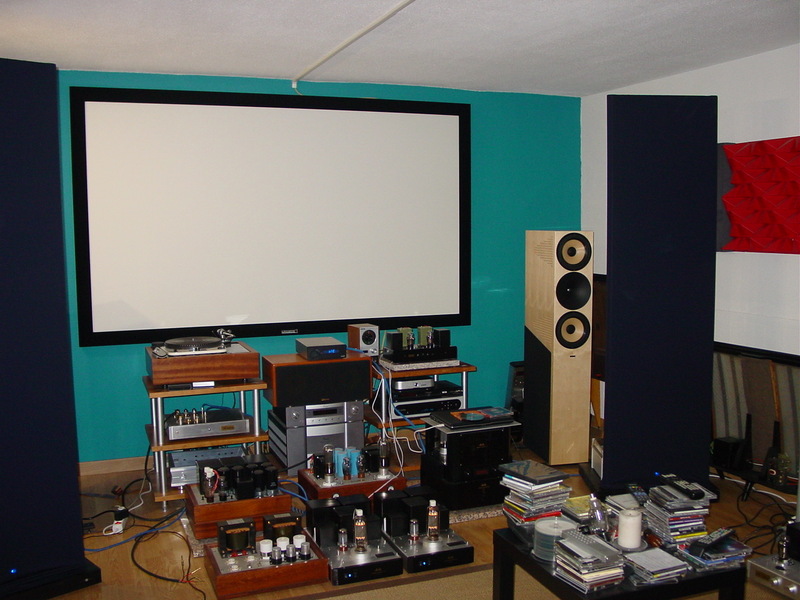 Jose’s listening room showing Acorns plus a lot of additional equipment. The Acorns have given me such great musical pleasure that now I spend most of my free time to listening music than making things. After found the right partners for the Acorns the pleasure of listening music is so rewarding that it is been difficult to leave the sofa. I would like to thank you one more time for these so great electrostatic loudspeakers. These was without any doubt the best loudspeakers of all my audiophile life.